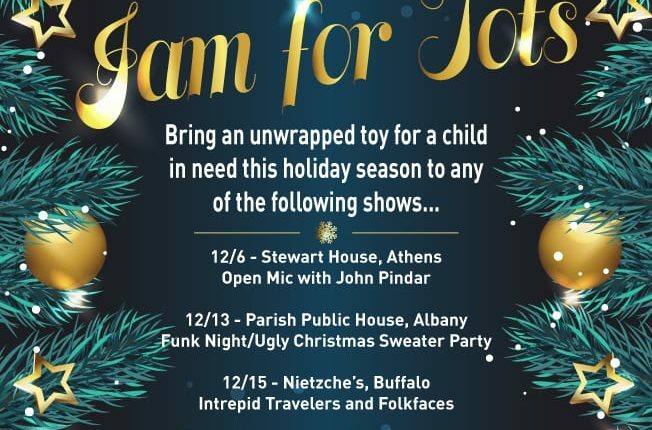 Tis the season to enjoy live music and support a great cause, across New York State! Annually, NYS Music works with bands and promoters across the state to help those in our local communities who are less fortunate and in need of a healthy dose of cheer this holiday season. Combining live music performances and the spirit of giving during the holiday season are a natural combination, and we present these 4 shows where fans are able to enjoy the best music across the state, and help kids out at each show. Or stop by Putnam Place in Saratoga Springs all month long and drop off a toy! In the Catskills, join John Pinder and the gang for Open Mic on the first Thursday of the month. 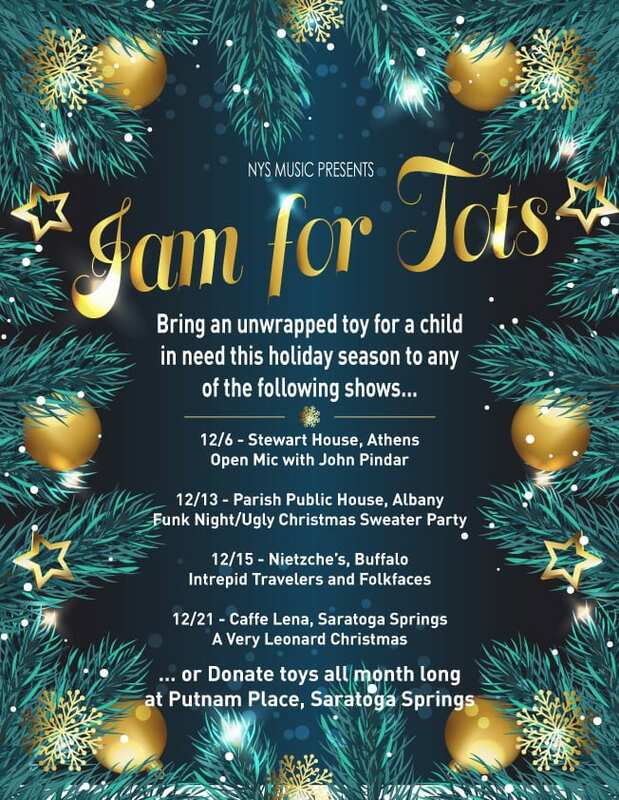 The jam lends a hand to the Toys for Tots drive this month by asking musicians and patrons to bring along an unwrapped toy for a less fortunate child. Jam for Tots has become a cherished tradition at The Stewart House. The list opens up at 6:30pm, be sure to ask the bartender or the host John Pinder to get signed up! All are welcome. Be it a solo, duo, group, spoken word, or stand up session, head down to the Stewart House to share your talent. It’s a Funk Night XMAS Ugly Sweater Party ft. Hayley Jane & Members of Kung Fu, West End Blend, Wurliday, & More! Come out and sing some funky XMAS classics with us at this special holiday rendition of NYS Music’s Albany Funk Night! 5$ off with a toy for our Jam n Tots drive. 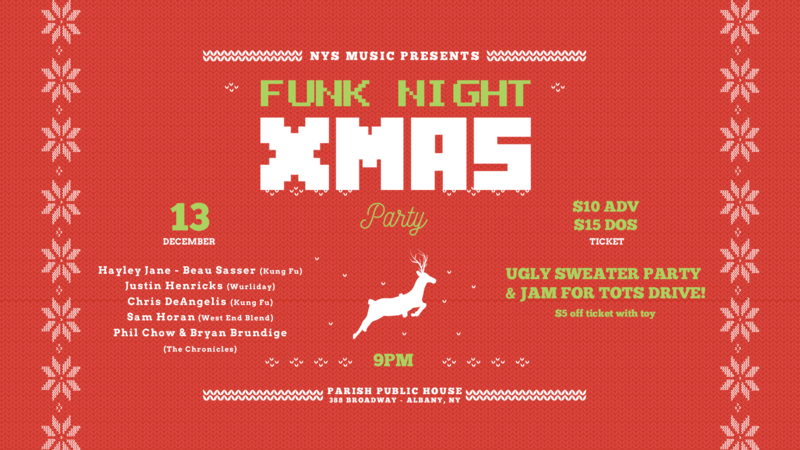 On December 13, celebrate a Funk Night Christmas with an Ugly Sweater Party at Parish Public House in Albany! Join the band and sing some Christmas songs at this special holiday rendition of NYS Music’s Albany Funk Night! Take $5 off the cover charge when you bring a toy for our Jam for Tots drive. The Funk Night Christmas lineup includes Hayley Jane, Beau Sasser (Kung Fu), Chris DeAngelis (Kung Fu), Justin Henricks (Wurliday), and Bryan Brundige and Phil Chow (The Chronicles). Tickets are $15, or $10 if you bring a toy. Let’s Be Leonard returns to Caffe Lena for their annual holiday show! Expect to hear your favorite Leonard boys performing the holiday classics sprinkled with their signature Leonard flavor!